The two-day workshop, held during ALS user meeting, will provide participants with software tutorial sessions for biological SAXS in addition to hands-on training in experimental techniques. The latest advances in SAXS studies on biological systems will be discussed with particular focus on advances in synchrotron scattering techniques, modeling of dynamic and flexible structures, bioSAXS with membrane protein, and integrating bioSAXS analysis within cryo-EM imaging. The first day of the SIBYLS annual workshop will focus on applied science while the second day will focus more on practical tutorials. We will begin with a brief run-through on current updates. Greg Hura, Berkeley Lab’s SAXS Beamline Scientist will introduce the future of high throughput. Three keynote speakers: Walter Chazin (Vanderbilt), Thomas Weiss (SLAC, Stanford) and Steve Meisburger (Princeton), will continue Dr. Hura’s discussion by elaborating on the basics of SAXS and the fascinating integration of bioSAXS in integrative structural biology. Michal Hammel, another one of Berkeley Lab’s SAXS Beamline Scientists, will present current developments in size exclusion chromatography coupled SAXS (SEC-SAXS) and give a talk about integrating high-resolution models in the SAXS modeling. Other distinguished speakers from the SIBYLS user community: Chris Brosey (MD Anderson) , Fatma Zehra Yildiz (Harvard) and George Ueda (University of Washington) will contribute to the basis of the workshop over the two days by sharing complementary experimental approaches and modeling techniques. For the second day, students and postdocs are encouraged to bring their own SAXS data collected at SIBYLS. During the morning session, we will provide an opportunity for participants to present and discuss their projects with the group. If you are interested in presenting, please email Kathryn Burnett. This will provide for a flux of ideas among workshop participants, and inspire new perspectives for future data analysis. The afternoon session will be dedicated to practical hands-on exercises with experts in SAXS software for data processing (SCATTER, FrameSlice and RAW, SAXS similarity maps, modeling tools (FOXS - MultiFoXS, BILBOMD and SAXS shape calculator). Registration: Registration is now open. To attend the workshop you need to REGISTER for the 2018 ALS user meeting. When you register, indicate that you plan to attend the “9th Annual SIBYLS bioSAXS Workshop”. We bring to your attention a nice review published recently in the European Biophysics Journal describing the theoretical and practical considerations when using SAXS to characterize macromolecular flexibility. The dynamics of macromolecular conformations are critical to the action of cellular networks. Solution X-ray scattering studies, in combination with macromolecular X-ray crystallography (MX) and nuclear magnetic resonance (NMR), strive to determine complete and accurate states of macromolecules, providing novel insights describing allosteric mechanisms, supramolecular complexes, and dynamic molecular machines. This review addresses theoretical and practical concepts, concerns, and considerations for using these techniques in conjunction with computational methods to productively combine solution-scattering data with high-resolution structures. I discuss the principal means of direct identification of macromolecular flexibility from SAXS data followed by critical concerns about the methods used to calculate theoretical SAXS profiles from high-resolution structures. The SAXS profile is a direct interrogation of the thermodynamic ensemble and techniques such as, for example, minimal ensemble search (MES), enhance interpretation of SAXS experiments by describing the SAXS profiles as population-weighted thermodynamic ensembles. I discuss recent developments in computational techniques used for conformational sampling, and how these techniques provide a basis for assessing the level of the flexibility within a sample. Although these approaches sacrifice atomic detail, the knowledge gained from ensemble analysis is often appropriate for developing hypotheses and guiding biochemical experiments. Examples of the use of SAXS and combined approaches with X-ray crystallography, NMR, and computational methods to characterize dynamic assemblies are presented. SAXS was used to characterize the structural effects of phosphorylation events that modulate the ability of retinoblastoma protein to associate with E2F and other proteins. This work has been published in Genes & Development in the May 8th Advanced Online Articles section. Cyclin-dependent kinase (Cdk) phosphorylation of the Retinoblastoma protein (Rb) drives cell proliferation through inhibition of Rb complexes with E2F transcription factors and other regulatory proteins. We present the first structures of phosphorylated Rb that reveal the mechanism of its inactivation. S608 phosphorylation orders a flexible ”pocket” domain loop such that it mimics and directly blocks E2F transactivation domain (E2FTD) binding. T373 phosphorylation induces a global conformational change that associates the pocket and N-terminal domains (RbN). This first multidomain Rb structure demonstrates a novel role for RbN in allosterically inhibiting the E2FTD-pocket association and protein binding to the pocket ”LxCxE” site. Together, these structures detail the regulatory mechanism for a canonical growth-repressive complex and provide a novel example of how multisite Cdk phosphorylation induces diverse structural changes to influence cell cycle signaling. Characterizing flexible macromolecules with SAXS. Unstructured proteins, RNA or DNA components provide functionally important flexibility that is key to many macromolecular assemblies throughout cell biology. As objective, quantitative experimental measures of flexibility and disorder in solution are limited, small angle scattering (SAS), and in particular small angle X-ray scattering (SAXS), provides a critical technology to assess macromolecular flexibility as well as shape and assembly. In a recent paper published in Biopolymers, Rob Rambo and John Tainer consider the Porod-Debye law as a powerful tool for detecting biopolymer flexibility in SAS experiments. They show that the Porod-Debye region fundamentally describes the nature of the scattering intensity decay, which captures information needed for distinguishing between folded and flexible particles. Particularly for comparative SAS experiments, application of the law, as described in their manuscript, can distinguish between discrete conformational changes and localized flexibility relevant to molecular recognition and interaction networks. This approach aids insightful analyses of fully and partly flexible macromolecules that is more robust and conclusive than traditional Kratky analyses. Furthermore, they demonstrate for prototypic SAXS data that the ability to calculate particle density by the Porod-Debye criteria provides an objective quality assurance parameter that may prove of general use for SAXS modeling and validation. Rambo RP, Tainer JA. “Characterizing flexible and instrinsically unstructured biological macromolecules by SAS using the porod-debye law.” Biopolymers. 2011 Aug;95(8):559-71. The figure, excerpted from the manuscript, shows SAXS experiments performed on an exemplary intrinsically disordered domain Rad51 AP1. Data was collected for both rad51 AP1 (red) and a fusion construct with E. coli maltose binding protein (MBP) (black). (A) Kratky plot demonstrating the parabolic shape for a partially folded particle (black) and hyperbolic shape for a full unfolded particle (red). (B) Porod-Debye plot demonstrating a clear plateau for the partially folded MBP-Rad51 AP1 hybrid particle. In the absence of MBP, the fully unfolded domain is devoid of any discernible plateau. SAXS capabilities of the SIBYLS beamline are demonstrated quite nicely in recent papers published in September and October. Datta AB, Hura GL, Wolberger C. “The structure and conformation of Lys63-linked tetraubiquitin.” J Mol Biol. 2009 Oct 9;392(5):1117-24. Epub 2009 Aug 4. Jain R, Hammel M, Johnson RE, Prakash L, Prakash S, Aggarwal AK. “Structural Insights into Yeast DNA Polymerase delta by Small Angle X-ray Scattering (SAXS).” J Mol Biol. 2009 Oct 7. Greenstein AE, Hammel M, Cavazos A, Alber T. “Interdomain communication in the Mycobacterium tuberculosis environmental phosphatase Rv1364c.” J Biol Chem. 2009 Aug 20. A paper has been published in The October 2 issue of Cell by Scott Williams et al. that sheds light on a previously missing piece of the double-strand break repair complex MRN (aka Mre11-Rad50-Nbs1). The paper entitled “Nbs1 Flexibly Tethers Ctp1 and Mre11-Rad50 to Coordinate DNA Double-Strand Break Processing and Repair” presents a compelling model of the role of Nbs1 (i.e “N” of the MRN) in coordinating double-strand break processing and repair. The paper was made possible in part by crystal structures and SAXS data of Nbs1 that were collected at the SIBYLS beamline. The Nijmegen breakage syndrome 1 (Nbs1) subunit of the Mre11-Rad50-Nbs1 (MRN) complex protects genome integrity by coordinating double-strand break (DSB) repair and checkpoint signaling through undefined interactions with ATM, MDC1, and Sae2/Ctp1/CtIP. Here, fission yeast and human Nbs1 structures defined by X-ray crystallography and small angle X-ray scattering (SAXS) reveal Nbs1 cardinal features: fused, extended, FHA-BRCT1-BRCT2 domains flexibly linked to C-terminal Mre11- and ATM-binding motifs. Genetic, biochemical, and structural analyses of an Nbs1-Ctp1 complex show Nbs1 recruits phosphorylated Ctp1 to DSBs via binding of the Nbs1 FHA domain to a Ctp1 pThr-Asp motif. Nbs1 structures further identify an extensive FHA-BRCT interface, a divalent MDC1-binding scaffold, an extended conformational switch, and the molecular consequences associated with cancer predisposing Nijmegen breakage syndrome mutations. Tethering of Ctp1 to a flexible Nbs1 arm suggests a mechanism for restricting DNA end processing and homologous recombination activities of Sae2/Ctp1/CtIP to the immediate vicinity of DSBs. SAXS Clarifies Mechanism of DNA Recognition by Polynucleotide Kinase. 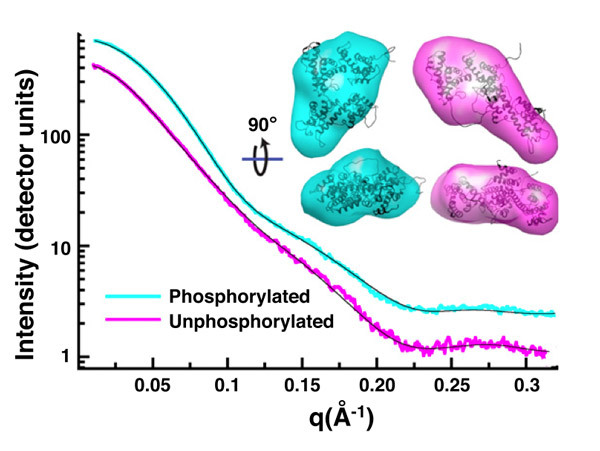 In this paper, published in Nucleic Acid Research, the authors used small-angle X-ray scattering (SAXS) combined with advanced computational approaches to characterize the conformational variability and DNA-binding properties of PNK. Extensive use of the SAXS capabilities of the SIBYLS beamline allowed the authors to visualize a flexible attachment of the FHA domain to the catalytic segment and localize the DNA in the DNA/PNK complex. Bernstein NK, Hammel M, Mani RS, Weinfeld M, Pelikan M, Tainer JA, Glover JN. "Mechanism of DNA substrate recognition by the mammalian DNA repair enzyme, Polynucleotide Kinase." Nucleic Acids Res. 2009 Aug 11. [epub]. In a recent article in the General Physiology and Biophysics we describe an analysis tool using relatively inexpensive small angle X-ray scattering (SAXS) measurements to identify protein flexibility and validate a constructed minimal ensemble of models, which represent highly populated conformations in solution. The resolution of these results is sufficient to address the questions being asked: what kinds of conformations do the domains sample in solution? In our rigid body modeling strategy BILBOMD molecular dynamics (MD) simulations are used to explore conformational space. A common strategy is to perform the MD simulation on the domains connections at very high temperature, where the additional kinetic energy prevents the molecule from becoming trapped in a local minimum. The MD simulations provide an ensemble of molecular models from which a SAXS curve is calculated and compared to the experimental curve. A genetic algorithm is used to identify the minimal ensemble (minimal ensemble search, MES ) required to best fit the experimental data. The SIBYLS beamline has recently been awarded 50,000 hours on the NERSC (National Energy Research Scientific Computing Center) to perform solution structure modeling using experimental SAXS data. Besides the usual ab-initio reconstructions programs a new approach in rigid body modeling BILBOMD has been parallelized on the NERSC supercomputer. It is commonly acknowledged that flexibility between domains of proteins is often critical for function. These motions, and proteins with large scale flexibility in general, are often not readily amenable to conventional structural analysis such as X-ray crystallography, NMR, or electron microscopy. We have developed an analysis tool using experimental SAXS measurements to identify flexibility and validate a constructed minimal ensemble of models which represent highly populated conformations in solution. The resolution is sufficient to address questions about the extent of the domain conformational sampling in solution? In our rigid body modeling strategy BILBOMD, molecular dynamics (MD) simulations are used to explore conformational space. A typical experiment involves MD simulation on the domain connections at very high temperature, where the additional kinetic energy prevents the molecule from becoming trapped in a local minimum. The MD simulations provide an ensemble of molecular models from which a SAXS curve is calculated and compared to the experimental curve. A genetic algorithm is then used to identify the minimal ensemble (Minimal Ensemble Search, MES) required to best fit the experimental data. If you are interested in learning about and/or using this valuable SAXS analysis tool please contact Michal Hammel (MHammel at lbl dot gov). In the September 19, 2008 issue of Cell, we report striking conformational rearrangements in the crystal structure of NEDD8~Cul5ctd-Rbx1 and SAXS analysis of NEDD8~Cul1ctd-Rbx1 relative to their unmodified counterparts. These results point to conformational control of Cullin-RING ligase (CRL) activity, with ligation of NEDD8 shifting equilibria to disfavor inactive closed architectures, and favor dynamic, open forms that promote polyubiquitination. Cullin-RING ligases (CRLs) comprise the largest ubiquitin E3 subclass, in which a central cullin subunit links a substrate-binding adaptor with an E2-binding RING. Covalent attachment of the ubiquitin-like protein NEDD8 to a conserved C-terminal domain (ctd) lysine stimulates CRL ubiquitination activity and prevents binding of the inhibitor CAND1. Here we report striking conformational rearrangements in the crystal structure of NEDD8~Cul5ctd-Rbx1 and SAXS analysis of NEDD8~Cul1ctd-Rbx1 relative to their unmodified counterparts. In NEDD8ylated CRL structures, the cullin WHB and Rbx1 RING subdomains are dramatically reoriented, eliminating a CAND1-binding site and imparting multiple potential catalytic geometries to an associated E2. Biochemical analyses indicate that the structural malleability is important for both CRL NEDD8ylation and subsequent ubiquitination activities. Thus, our results point to a conformational control of CRL activity, with ligation of NEDD8 shifting equilibria to disfavor inactive CAND1-bound closed architectures, and favor dynamic, open forms that promote polyubiquitination. Quen Cheng in the Cooper lab has done a nice set of experiments to address the usefulness of various readily available detergents for improving the behavior proteins in SAXS experiments. Here are the recommended concentrations of detergents that may contribute the least amount of background to SAXS studies. Omitted from this list are any detergents that would need to be used at concentrations < 0.1%, based on the above table and the detergent CMCs. Detergents can be extremely useful in preparing monodisperse samples for SAXS. However, they can also contribute enormous background scattering, potentially masking the desired protein signal entirely. We recommend to not using detergents in entire protein preparation. We observed only a few cases (~0.1%) where the detergent ( bellow CMC concentration ) did not affect the protein signal. Basically, there is a high chance that detergent will make your SAXS data useless!!!! We searched for SAXS-compatible detergents by collecting data on 73 detergents in PBS. By subtracting the PBS signal from the detergent signal, we can observe the scattering contribution of detergent alone. We first collected data at 1xCMC (critical micelle concentration) to compare the scattering effects of different detergent types. Next, we investigated the effects of concentration relative to the CMC, collecting data ranging from 0.1xCMC to 3xCMC on a subset of the 73 detergents. Unclear why detergents scatter differently; no obvious trends in MW, micelle size, % concentration, etc. What the data provides, however, is a starting point for finding a detergent that improves the monodispersity of your sample without dominating the SAXS signal. The following table include links to scattering curves of each concentration of detergent we analyzed, with Glucose Isomerase plotted as a reference protein curve. A sortable Table of detergents.